I was looking around at inspiration pictures this week and just happened to stumble up a slideshow on Better Homes & Gardens’ website with really cool repurposed furniture. 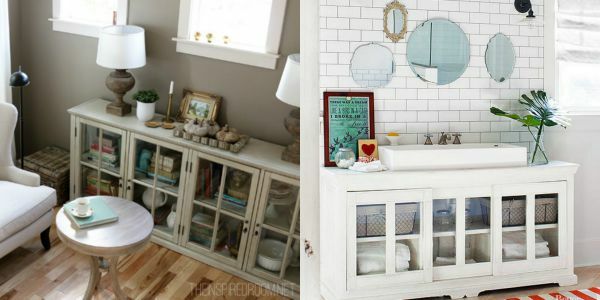 I love a unique bathroom that has a bit of character and personality, and these vanities are awesome! Each one made me think about furniture I already have and how each piece might have the potential to be transformed into a vanity! Not that I’m planning to use my furniture in that way, it was just an observation. 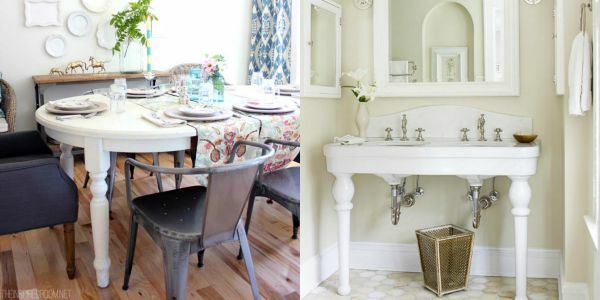 Look at each inspiration picture, and a comparable piece I already have in my own home! 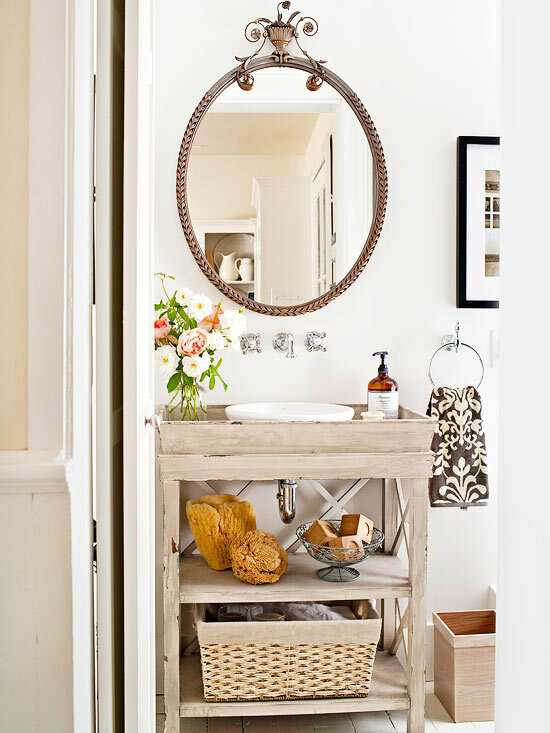 Your piece might need a little reconfiguring, perhaps adding a new top or taller legs, but with a little imagination, you could make a vanity out of just about any table, cabinet or console table. You could do the same with pieces in your home. Perhaps you already have! 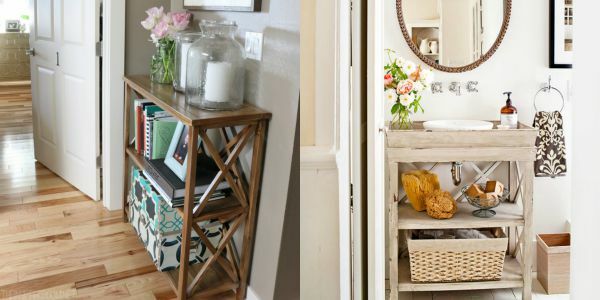 If you’ve revamped a piece of furniture or turned it into something new, show it off over at Home Love Stories! It’s easy, upload photos and tell us your story, what furniture have you reimagined? What do you already have that could be transformed into something new? I remember the first time I saw this in a friend’s wonderful waterfront home in West Seattle. It was a bombe chest in the powder room and it was fantastic! The room was very dark in colors and the chest glowed with its integrated bowl and jewelry hardware. I felt I was in Venice washing my hands and looking into a similar golden mirror above the chest. Very nice! That sounds beautiful! My mom has done this before, too, I think it’s a fabulous idea! Yes! 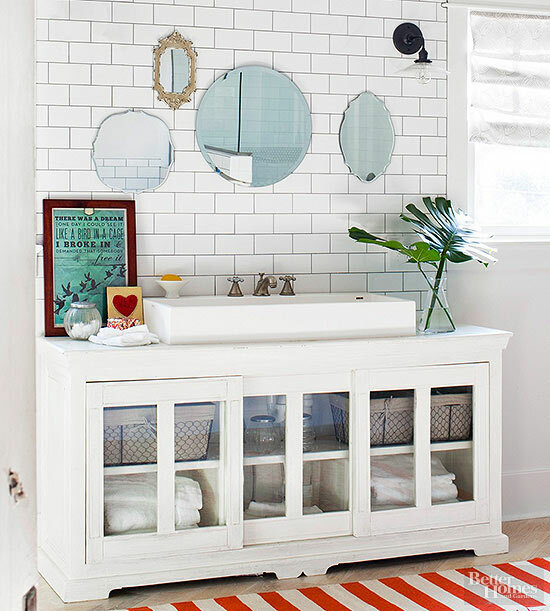 And I love the way unique vanities look too! So much nicer than ordinary ones! I agree, it’s so nice to have something that looks a little more custom and less mass produced! When we redid our (tiny) master bathroom, I found a perfect little, old wood cabinet to sand, stain, and cut up to become our vanity. I love it, including the stray bits of chartreuse paint I couldn’t quite get out of the cracks. 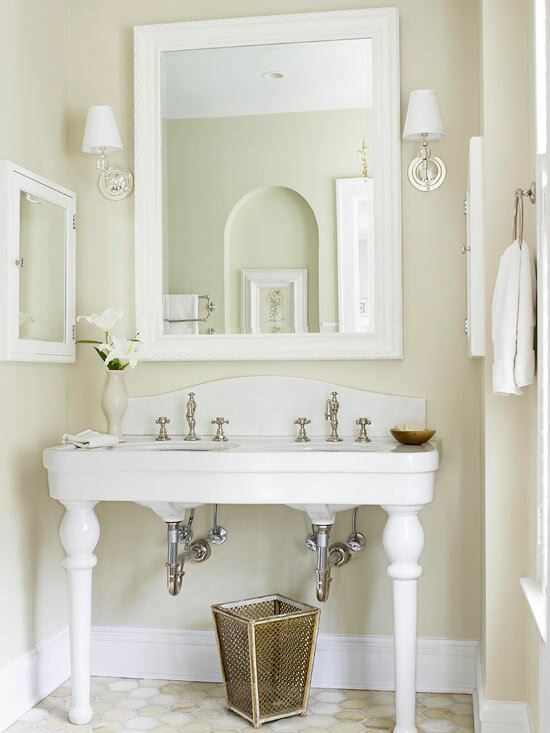 It’s old, patina-ed bronze hardware somehow looks perfect with the bright chrome elsewhere in the bathroom. The only problem is, these custom touches of love will make it so hard to ever leave this house!